After gating to a world on the edge of a black hole, the S.G.C. cannot disengage the Stargate -- threatening all of Earth with a time-distorting gravity field. SG-10, a new field unit commanded by Major Henry Boyd and on its first mission, is in trouble. The three men and one woman rush, seemingly in slow motion, toward the Stargate on another world, and begin dialing home to Earth. The wormhole is established, but the signal from the team’s G.D.O. comes in many times slower than normal. Captain Carter and Lieutenant Simmons speed up the signal with the computer, and recognize it as SG-10’s iris code. The iris opens, but no team comes through. A probe is sent to the planet, where the truth is learned: the planet is orbiting a newly-formed black hole. The intense gravity has caused time to slow on the planet; though the wormhole was open for several minutes on Earth, SG-10 perceived it to be open for only a fraction of a second. SG-10 cannot be rescued, and General Hammond orders the gate shut down. But the sequence fails: the gravity of the black hole is holding the other end of the wormhole. All of Earth is in danger as the intense gravity field slowly begins to expand away from the Stargate like a bubble. Time has already begun passing slower within the S.G.C. After the facility is out of contact with the surface for some four hours (only minutes to S.G.C. personnel), an Air Force special ops unit is sent in to investigate. The team is commanded by Colonel Frank Cromwell, an old acquaintance of Jack O’Neill’s. The team tries several methods of shutting down the gate. They even pull the bases’ main breakers, eliminating all power to the Stargate (which has already been activate long enough to drain the capacitors that power it — longer, in fact, than the theoretical limit of the amount of time a wormhole can be established). But the attempts do not work; the gate, it seems, is pulling energy directly from the black hole itself. Meanwhile, General Hammond has gone looking for a way to contact the president and jointchiefs. He ascends the elevator to a higher level, and is met by a tense group of soldiers. After losing contact with the facility, the government has considered the possibility of an alien incursion. Hammond is whisked away by Major Davis, a representative of the president and joint chiefs, for an emergency meeting. Hammond returns to the base only minutes after leaving — from the perspective of SG-1. He has in fact been gone for nearly a day. After working through the problem all night, officials have decided that the best course of action is to destroy the Stargate and the S.G.C. Carter hurries to the surface, so that she will have more time to work through the problem. The whole S.G.C. 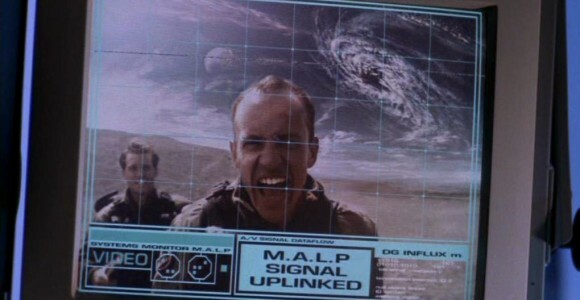 is evacuated, with O’Neill and Cromwell left behind to activate the base’s self-destruct systems. The truth of their history with one another soon surfaces: O’Neill served under Cromwell’s command many years ago. During a special ops mission in Iraq, something went wrong and O’Neill was shot. Cromwell presumed him dead, retreating with the rest of the team. Jack spent four months in an Iraqis prison, and has never forgiven the colonel for leaving him behind. Cromwell believes he had to make the best call he could at the time, but seems eager to do something to make it up to Jack. O’Neill will have nothing to do with him. On the surface, Carter works through the night. It is only when Hammond suggests setting up a new S.G.C. program with the second Stargate (“Touchstone”) that Carter finds a new solution. A directed energy surge may cause the wormhole to jump to a new location, just as it did when O’Neill and Carter discovered the second Stargate on Earth (“Solitudes”). Carter and Teal’c rush back to the S.G.C., where only a few minutes have passed for O’Neill and Cromwell. The self-destruct is aborted. Instead, the two men must slide down cables horizontally into the gate room, placing a bomb at a precise distance and angle from the gate’s event horizon. The plan is successful, but with one casualty: an accident causes Cromwell’s rope to break, and he is left dangling near the wormhole’s extreme gravity, held tightly by O’Neill. Rather than risk pulling O’Neill in with him and failing to set the bomb, Cromwell lets go and falls into the Stargate. The explosion causes the other end of the wormhole to jump to another gate, and Carter shuts it down. O’Neill recovers in the infirmiry after learning that Teal’c managed to pull him far enough away from the bomb before it exploded. Captain Carter’s wormhole theory states that a wormhole is an interdimensional conduit, and can only form between two open gates. Wormholes are not always present, needing only to be accessed. Rather, it seems, the Stargate actually creates a wormhole. The indigenous life on the planet explored by SG-10 (designated P3W-451) had recently become extinct. SG-10 was commissioned in the second episode of Season Two, “In the Line of Duty”. O’Neill’s four months in an Iraqis prison was not his first time stranded there. He parachuted over the border of Iran and Iraq during his years in black-ops, and had to hike out on his own over the course of nine days — with a broken leg (“Solitudes”). It is possible that Colonel Cromwell is still alive somewhere. If the explosion caused the far end of the wormhole to jump to another planet before Cromwell reached the end of the wormhole and emerged through the other side, the colonel would have avoided his fate in the black hole and ended up on another planet. Having little knowledge of the Stargate program, Cromwell would have no idea how to gate to Earth again. SG-10 was commanded by Major Henry Boyd, until the team’s demise on their first mission. There is a theoretical limit to the length of time that a wormhole can be maintained. The S.G.C.’s Stargate is powered by capacitors (giant batteries). The original S.G.C. Stargate iris was destroyed by the black hole’s tremendous gravity. It has been replaced with a new trinium-strengthened iris, probably using trinium (a rare metal not found on Earth, and stronger than steel) from the Salish Indian world (“Spirits”). Jack O’Neill – Years ago under the command of Frank Cromwell, O’Neill was part of a special ops infiltration mission in Iraq. He was shot, and presumed dead. The team left him, and Jack spent four months in an Iraqis prison. He has never forgiven Cromwell for leaving him behind. Now, his former C.O. has sacrificed his life for O’Neill and the S.G.C. Paul Davis – Major Davis is a representative from the office of the Pentagon. How did Carter know that the black hole was newly-formed? If this was their first mission, what has SG-10 been doing since they were commissioned so many months ago (“In the Line of Duty”)? Will a new team designated SG-10 be formed? Is the second Stargate back at Nellis (Area 51)? Is Colonel Cromwell still alive? VOTE! How would you rate SG-1's "A Matter of Time?"